A custom built home on the end of 3/4 mile of gravel country road. Beautifully finished yet very comfortable. Centrally located in North Kitsap County. 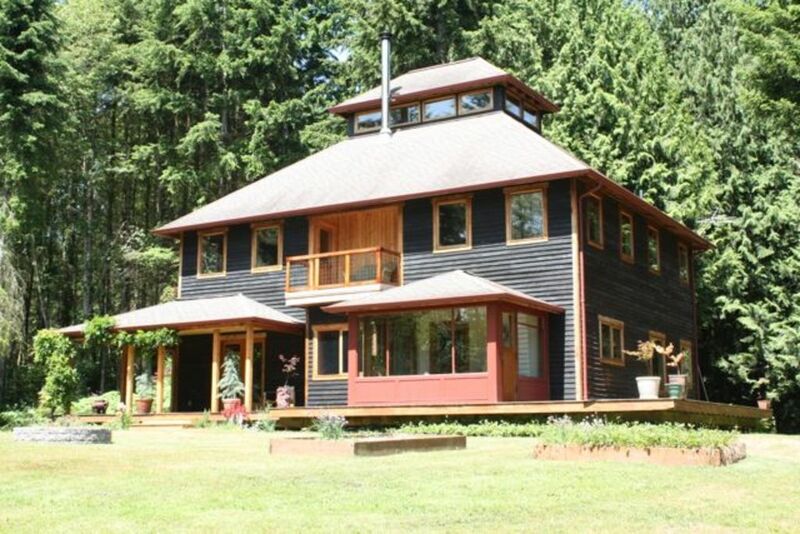 House is on 8.5 private acres that is a very nice mix of open sunniness and forest. There is lots of porches both covered and open Large yard with a fire pit and room for outside games. Interior is 2400 feet of comfort. Well equipped full kitchen with dinning room. There are 4 bedrooms, 3 on the second floor have king beds and one on the first floor has a full. There are 3 full baths, on the second floor, one in the master bedroom with a shower and claw foot tub, one shared with a shower tub combo. The first floor bath has a claw foot tub. In the living room there is a Steinway baby grand. I have lived in Washington for the last 30 years. I built the Foxglove house and my shop in 1991, and raised my two daughters here. I am a woodworker, building cabinets, furniture and lighting and work and live on the property. Kitsap county is within easy access to Seattle, olympic peninsula and many small towns. I chose this property for its beauty and privacy and access to community. The Foxglove House is Home. A easy place to kick back, enjoy nature and relax. Wonderful place to stay! So quiet and peaceful. If I didn't have a wedding to go to I would have loved to curl up with a good book. To top off my wonderful stay I got a perfectly timed visit from Roscoe that made my day! I would stay again. nice place to stay a couple of nights and most importantly Carl was very helpful and responsive all the time. though we visited during winters and had good time but would be an excellent option for summers. Great area to get away from it all. Convenient to the beautiful coastal area. Also, once in a lifetime experience came across a grey wolf nearby. Thanks will be back for fly fishing. If you enjoy beautiful craftsmanship in a quiet setting, then you need to experience this home. We had a wedding to attend at Kitsap Memorial State Park. Once we learned the route, the drive was an easy 15 minutes to the park, and it was nice to come back to a comfortable home, with comfortable beds and spacious bathrooms, with a well supplied kitchen. Amenities are a short driving distance to Poulsbo. The community of Port Gamble is worth a visit, and if you are heading over to the Olympic Peninsula, the Hood Canal Bridge is 15 minutes away. Owner Carl, who built the home, was helpful and close by if needed.